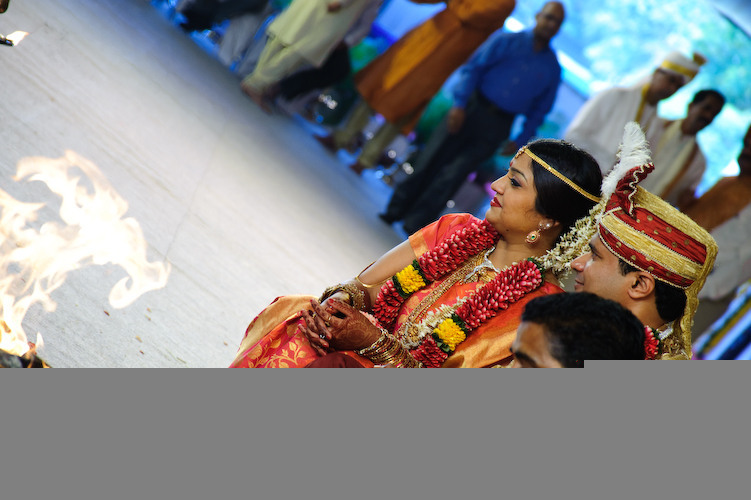 Quite a few of you have been waiting for the Bangalore Wedding pictures. As one of my fellow guests said: “Our eyes were full of colour”. I think the pictures speak for themselves so I’ll be keeping comments to a minimum. I may just give some context -Â shamelesslyÂ lifted from a card we were given at one of the events which explained the festivities, rituals and their significance in brief. The wedding ceremony starts with the bride being escorted in a procession to the Mantapam (the decorated stage on which the ceremony is to take place). Friends and family take part. 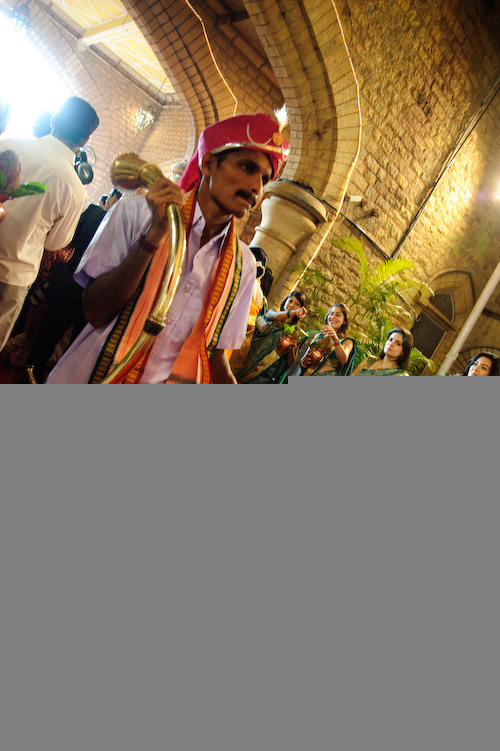 The procession is led byÂ bridesmaids carrying brass pots filled with rice and coconut on the leftÂ and bridesmen carrying ceremonial umbrellas on the right. 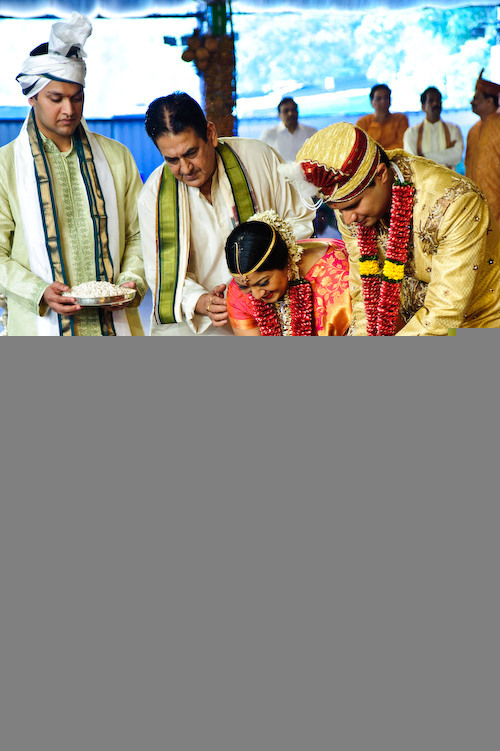 I understand that generally, they are dressed in all manner of colours, but this time was different – the bridesmaids were inÂ beautifulÂ green saris, and the men in white silk robes. For the most part, that is. If I’m not mistaken there was one bridemaid alone who hadn’t been issued with her green sari – and wore a beautiful white one instead. The men also had one stand-out: Me. On my arrival, one of the bride’s uncles pulled me aside and handed me a ceremonial umbrella. When I objected, pointing out the red kurtha I wore, he said: “nevermind that, we want you here”.Â I couldn’t begin to express how touched I was by that gesture – at being asked to participate in, and not simply attend, my friend’s wedding. Once the bride is settled on the Mantapam, and the groom arrives, he too is escorted along with his friends and family to the Mantapam in a procession led by the same bridesmaids and men.Â That complete, we were all led onto the Mantapam as well, and sat to the right of the stage to watch the ceremony. The wedding hall was massive, with seating perhaps for thousands in front of the stage, but I felt that it was a cosy ceremony in which there was just us, we few on the Mantapam. Evidently, I took no pictures of the processions and the initial part of the ceremony as my camera wasn’t with me, and I couldn’t anyway. Ali – am so grateful to him – the fine gent to whom I’d handed the camera for safekeeping – came up to the stage and handed me the camera early on. Thanks to him, I got the chance to take these pictures you see here. And from a different angle to that of the photographers clustered stage front. 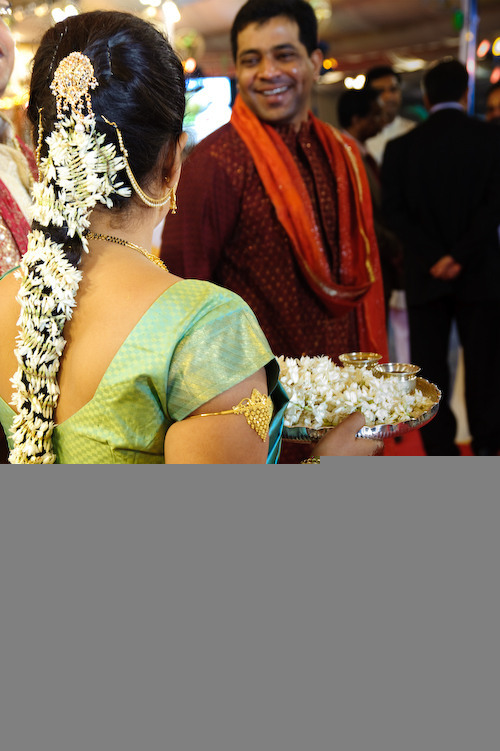 I was struck by how similar some of the rituals and concepts evident in this beautiful South Indian wedding are to those in other cultures. 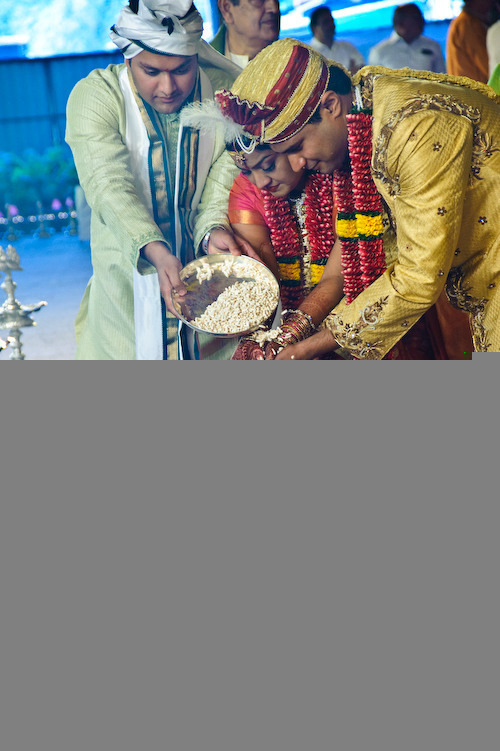 For instance – the raining of Akshatha (rice) on the happy couple – common to Christian and Muslim weddings. Also, the three rounds the couple effected around the holy fire during the wedding ceremony proper, which echoes the three rounds around the altar in some Christian (notably Orthodox and Greek Catholic) wedding ceremonies (called the Dance of Isaiah). I understand that this is a ritual that predates Christianity. 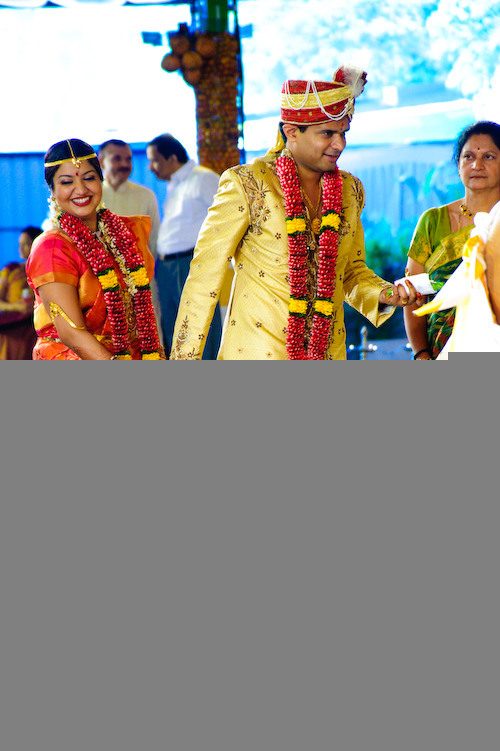 The various explanations given for the three rounds in each culture and religion may vary, but the symbolism remains the same – theÂ newlywedsÂ taking their firsts steps together as one. Anyway. Enough talk. Picture time! 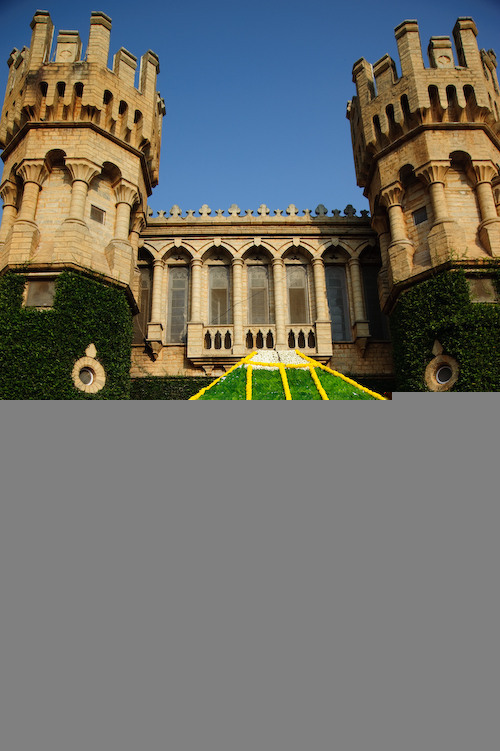 Above, the entrance to Bangalore Palace on the morning of the wedding. 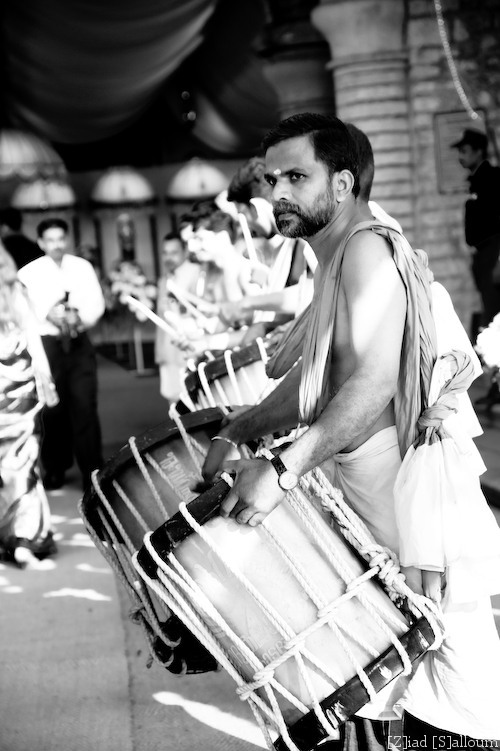 Below, one of the line of drummers who greeted us at the entrance to the palace. This lady’s long hair was bedecked in jasmine. A lovely sight. One of the trumpeteers who preceded the bride. The lovely bride, looking regal. Here, the bride and groom after holy water was poured on their hands during the Dhare. 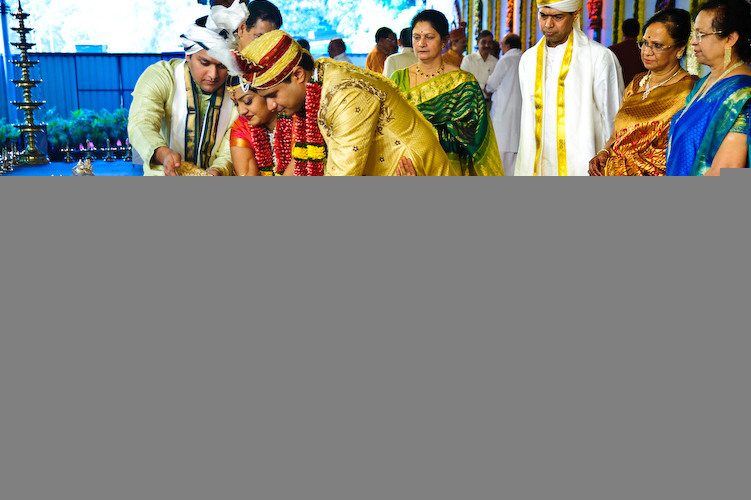 The Dhare is the prayer ritual which follows the wedding ceremony proper. Prayers are offered to Agni, the Lord of Fire, who dispels darkness and leads the way to the light of wisdom and knowledge. 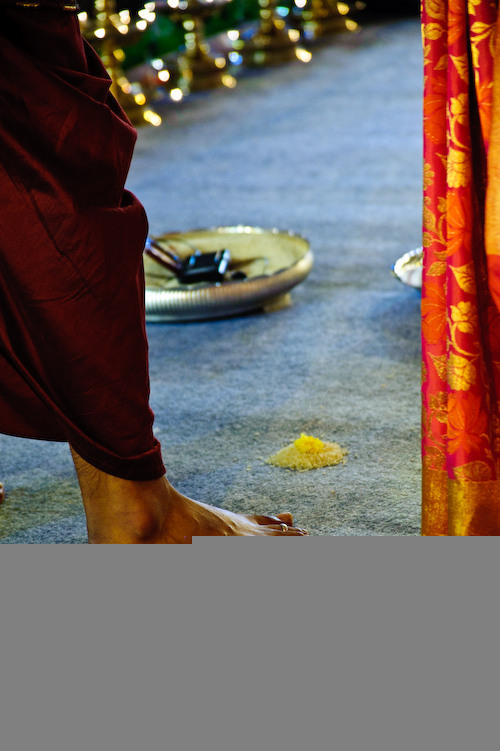 This is one of a series of saffron mounds, seen between the groom and bride. These were crushed by the brideÂ during the ceremony. An ecstatic bride and groom during the one of the rounds of the saptapadi (the seven rounds around the holy fire). I can easily say it was the most beautiful and moving weddings I have yet attended. In closing, here’s another picture from the Bangalore Palace grounds. 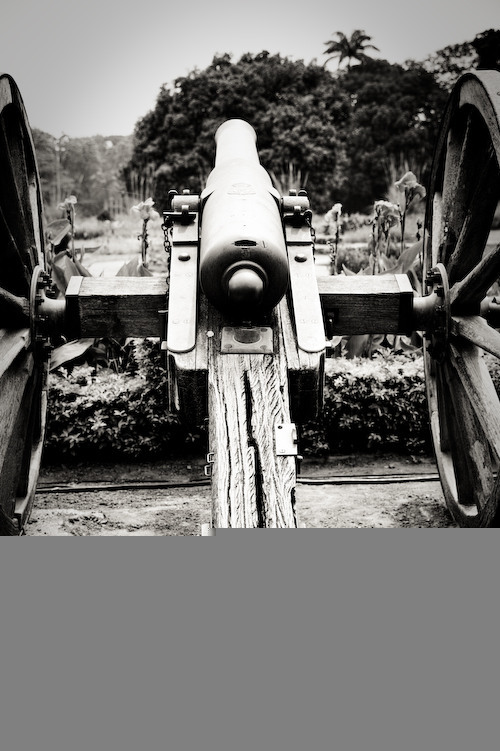 Now, this isn’t strictly speaking wedding related – but the cannon was just sitting there outside the Palace gates, looking all cannon-y. Couldn’t resist. Hehe. More pictures coming soon! Including pictures of my favourite wedding-related event – the giving away ceremony! P.S. Any errors in the descriptions of the ceremony and rituals are mine own alone. Please do feel free to clarify if you like.